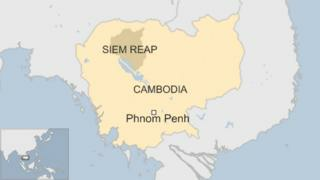 Five people have been killed in a nightclub fire in Cambodia, including an Australian tourist, local police have confirmed. Tom Ricketson, 32 and from Sydney, suffocated in blaze at the Hip Hop club in north-western city of Siem Reap. He had arrived in Cambodia last week. The four other victims - three women and a man - are believed to be locals. The fire - which started overnight - was caused by an electrical fault, the police said. The club in the popular tourist resort had no windows and only one door, the police said. An investigation into the blaze is now under way. Mr Ricketson is believed to have worked with the disabled community in Sydney, according to The Sydney Morning Herald newspaper. In a statement, Mr Ricketson's family said he was "a warm and wonderful human being who has been taken from us far too soon". "Tom had fallen in love with the people of Cambodia and had spent 10 days with families who live in a tip in Phnom Penh. "He was deeply moved by the hardship they faced on a daily basis and had decided to devote the next year to raising funds to build co-operative housing for these 20 families. Our family will now work to ensure that this becomes a reality."